Dumbbell weight progression is the take away theme in Turbulence Training Day 17. Home fitness workouts that'll burn fat and sculpt your body in 4 weeks. 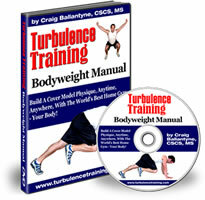 Welcome to day 17 of Turbulence Training's Buff Dudes and Hot Chicks fat burning workout. "Hello and welcome to day 17 of the Buff Dudes and Hot Chicks workout, I'm Asad from Better4Fitness.com. Today I decided to increase the weight on the dumbbells, it seemed like a good day to progress. Going from last week's workout, where at the end of it I had a little bit of energy to spare. So I thought this week's upper body workout, I'll increase the weights and see how I go (dumbbell weight progression). Even though it was tough, I managed to complete all the sets and intervals. So it shows that it was a really good time to progress. I still managed to complete the workout, but I didn't have very much energy left over at the end of it. So that's it for today's workout recap, go to Better4Fitness.com to see a list of today's exercises. Stay tuned for today's exercise speed mashup, it's a good one today so hopefully you'll enjoy it. And one more thing before I go, just want to say a quick shout-out to Ania, who started the Buff Dudes and Hot Chicks workout so I'll be keeping track of her progress. And I'll see you all tomorrow, take care, peace!"